I love this challenge! I join in every year. Some years I do better than others. In 2015, I kinda did poorly with so far only reaching 3 of the 9. I aim to do much better in 2016, and get them all!! 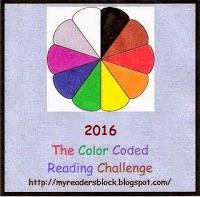 This does seem like a fun, quirky challenge as you try to find books with color in the title!